Product Range > Plant Lubrication > Multiline Lub. > Multiline Radial Lub. Multi-line Radial Lubricator is a device meant to discharge metered amount of oil grease from different plunger pumps housed in a common body. 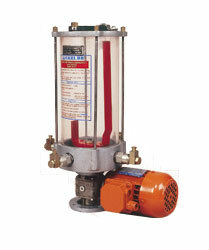 Each plunger pump delivers oil grease at a high pressure to the lubrication point independently. Multi-line Radial Lubricator comprises of a single pumping station having a number of pump-element assemblies placed radially and fitted onto the outer periphery of the housing. These pump elements are actuated by a cam which is rotated by a speed reduction drive coupled to an electric motor. The dose-cycle of the pump-element is adjustable. Thus multiline lubricator can have pump- elements ejecting different dose cycle. The dose cycle can also be adjusted 'in-situ' by an adjusting screw provided in each pump-element. Reservoir stores the oil grease. 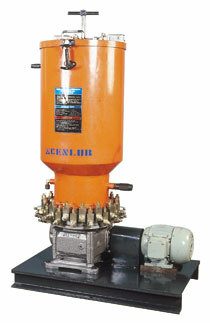 It is provided with a reflector plate which continuously stirs the grease during rotation of cam. For filling grease into the reservoir, a port in the front side of the housing is provided. The system is meant for continuous running. However, these types of lubricators run intermittently through controller where ON time is a parameter for running the lubricator while OFF time is idle.